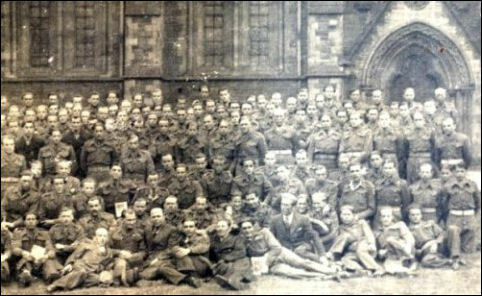 Ukrainians in the Polish Armed Forces under British command – several thousand Ukrainians who came to the United Kingdom during or shortly after the Second World War as members of the Polish Armed Forces abroad (see below), or who joined on arriving in the UK. The Ukrainians in question came to the UK by several routes. The first group to arrive consisted of several dozen Ukrainians who were already serving in the Polish Army or Polish Air Force before the war. After the German and Soviet invasions of Poland in September 1939 they were among the Polish forces personnel who fled to Romania or Hungary, from where they were evacuated to France. After the German invasion of France in May-June 1940 they were among those who were evacuated to the UK. In 1942-1943 a small number of Ukrainians arrived in the UK from the USSR. They were former residents of Western Ukraine who had joined the Polish army created in 1941 in the USSR and subsequently volunteered for training with the Polish Air Force based in the UK. Between September 1944 and the end of the war in May 1945, about a thousand Ukrainians came to the UK from France. These were mainly forced labourers or conscripts from Western Ukraine who had been captured along with German personnel by the Western Allies after the D-Day landings in Normandy. To avoid being forcibly removed to the USSR (in accordance with British-Soviet and US-Soviet agreements on the mutual repatriation of their citizens) they joined the Polish armed forces, on the grounds that before the war they were Polish citizens. Some joined the Polish forces in France before being transferred to the UK, others were transferred as prisoners-of-war and joined in the UK. In 1946 some 3,000-5,000 Ukrainians arrived in the UK as part of the Polish II Corps under British operational command, which was transferred from Italy. In 1947 and 1948 a small number of Ukrainians came to the UK from Palestine, where they had remained after the 1943 transfer of the Polish II Corps from the Middle East to Italy. After demobilisation, most of the Ukrainians who had been members of the Polish forces chose to remain in the UK and joined the Polish Resettlement Corps (see below), although many subsequently emigrated to other countries. During the war years some of those serving in the UK-based Polish forces began to make contact with members of the pre-war Ukrainian community in Manchester. Shortly after the war ended a group of volunteers began to plan the formation of an Association of Ukrainian Soldiers in the Polish Armed Forces, which was established in January 1946 as the Association of Ukrainians in Great Britain (AUGB). Most of the Ukrainians in the Polish forces who were already in the UK by the end of the war joined the AUGB. Of those in the Polish II Corps, only a relatively small proportion became members, some while they were still in Italy or Palestine, and others after the Corps was transferred to the UK. Photo: Ukrainians in the Polish Armed Forces at a general meeting of the AUGB. Edinburgh, 1946. After the September 1939 invasions of Poland by the German and Soviet armies, tens of thousands of Polish servicemen were forced to flee Poland. The majority reached Romania or Hungary, from where they were subsequently evacuated to France or French territories in the Middle East. They formed the core of the Polish Armed Forces which were established under the direction of the Polish government in exile but under French operational command. In the summer of 1940, after the German invasion of France, around 20,000 Polish forces personnel, together with the Polish government, were evacuated to the UK. Here the new Polish forces headquarters were established and Polish units under British operational command began to be formed. In subsequent years additional personnel were transferred to the UK from various countries or recruited within the UK. The Polish army units based in the UK came to be known as the Polish I Corps. Polish Air Force units were established under Royal Air Force command. After the June 1941 German invasion of the Soviet Union, a Polish army was created in the USSR on the basis of a Polish-Soviet Military Convention. Although it was an integral part of the armed forces of the sovereign Polish Republic, it was placed under Soviet operational command. The army was composed of Polish citizens who were within the Soviet Union at the time. These were mainly prisoners of war captured after the September 1939 Soviet invasion of Eastern Poland, and civilians subsequently deported from the occupied territory. It was commanded by General Władysław Anders, and hence popularly known as the “Anders Army”. The formation of the army began in the south-eastern part of European Russia, between the River Volga and the Ural mountains. At the beginning of 1942 it was transferred to the area around Tashkent in Uzbekistan, and later that year to Iran and Iraq. There it was brought under British command and merged with other Polish forces, which had been assembled in the Middle East from 1940, to form the Polish Army in the East. In July 1943 this became the foundation of the Polish II Corps of the British Eighth Army. The Corps was transferred to Palestine and subsequently, via Egypt, to Italy, where it took part in several Allied operations. At the end of the war the Corps initially remained in Italy. Between May and November of 1946, after a decision to demobilise the Polish Armed Forces, it was transferred to the UK. In 1946 a transitional unarmed unit within the British Army, the Polish Resettlement Corps (PRC), was created with the aim of facilitating the orderly dispersal into civilian life of those members of the Polish forces who chose to remain in the UK after the war (not wishing to return to Communist-controlled Eastern Europe). Enlistment in the PRC began in September 1946. It was technically voluntary, though the British authorities strongly urged all those remaining in the UK to join the Corps. The PRC personnel were accommodated throughout the UK in military camps which were progressively brought under civilian administration. They were provided with English language tuition, vocational training and familiarisation with British institutions. At the same time, suitable civilian employment was sought for them. At the end of September 1949 the PRC was disbanded.